in the town of Lunenburg, Nova Scotia. As I mentioned in yesterdays blog we had to return to Halifax for a few more days. 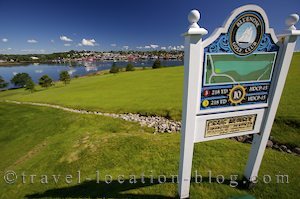 Before we left Lunenburg, we headed to the Bluenose Golf Club for a different perspective of the town. The tenth tee offered a great view with the sweeping lush grass of the greens in the foreground.